From prepping meals quicker to practical storage, a small kitchen island adds functionality to a compact cooking space. To help you find the perfect option for your home and needs, we gathered a wide range of examples including mobile carts, counter hacks, built-in units, and repurposed solutions. Get ready to make working and even entertaining in your cooking space more enjoyable — behold these small kitchen island ideas. In this modern, custom cooking space by HA Architecture, a small built-in kitchen island amplifies the room's compact square footage with several practical solutions. The butcher block topper provides bonus space for home chefs. The base cabinets underneath add useful storage. The island's exterior offers a spot to hang a step ladder and kitchen rail. 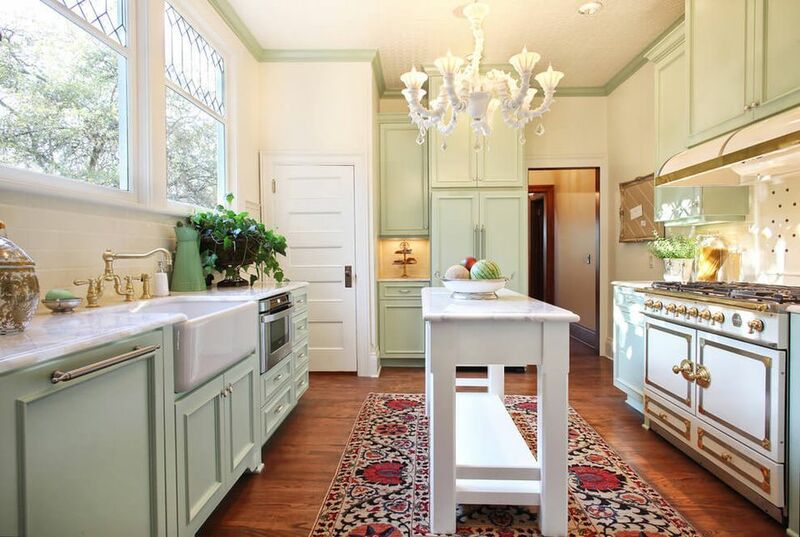 Here the team at Heidi Caillier Interior Design out of Seattle, Washington modernized a small old kitchen in a Tudor home without forfeiting the abode's true character. Brick floor, marble backsplash, and sandstone countertops are touches that feel in step with the exterior architecture. The narrow marble kitchen island with black legs also feels true to the home's architectural integrity. The best part? Because it is not built-in, it can be moved to the main living area for parties. A black kitchen island pushed up against the wall doubles as a home bar in this kitchen in a small apartment remodeled by Thibaut and Thewood, a wood workshop based in France. The cubby storage on the front facing side is for wine bottles. The island also conceals a mini refrigerator. A black and white kitchen by Studio Surface, an interior design firm out of Del Mar, California gets a functional lift from a narrow, stainless steel chef's table. The handy piece of furniture makes an excellent kitchen island at a fraction of the cost. You can pick one up at most restaurant supply stores for around $100 and more. Additional features worth mentioning include the backless stainless steel stools that fit under the chef's table. The black countertops are durable soapstone. On the ceiling are rustic wood beams punctuated by a stunning metal pendant light fixture. HA Architecture situated in Austin, Texas gave this small kitchen a contemporary aesthetic. The existing cabinetry and old countertops were all replaced. The kitchen island in the foreground was also a spanking new addition. Its stepped, two-tier design created extra elbow room for cooking and space for two to eat meals. After renovating her cooking space, Leslie, the interior design enthusiast at Deeply Southern Home realized she did not have not floor space for a traditionally sized kitchen island. So she whipped up a custom solution out of salvaged parts. The final result is modern farmhouse inspired beadboard island with both cabinet and shelf storage. We love projects that turn discarded items into practical home features like this idea by the thrifty do-it-yourselfer behind the blog Traer Loves. She transformed two antique wood dressers (both over 100 years old!) into small kitchen islands with drawer storage. Both pieces of furniture were initially dark stained wood. To lighten things up, she refreshed them with white chalk paint. The dresser on the left has a "chippy" distressed finish. On top of both kitchen islands are slabs of butcher block. Do not have room for a kitchen table? Consider this idea by Heidi Caillier Interior Design out of Seattle, Washington. The team rethought the floor plan when creating this fresh, white kitchen in a Mercer Island home. Opening up a few walls, and installing new windows expanded and brightened the room's square footage. Making the space even more functional is the eat-in kitchen island. Kitchen updates are expensive. In fact, the average cost to remodel a cooking space in the U.S. is around $23,000 and can skyrocket to as much as $35,000 according to several different home improvement surveys done in 2018. That is why we love this super frugal small kitchen island hack by Courtney, the avid DIY'er behind, Golden Boys and Me. Her creation was whipped up using three IKEA Billy bookcases. Topping off the project is a butcher block countertop also by IKEA. This clever hack by the blogger who pens Sawdust 2 Stitches will have you running to the nearest garage sale. That is where she picked the old cabinets to create the small kitchen island shared here. After removing the doors and original hardware, she realized there was enough room for two tall trash cans, which freed up lots of floor space. Even better, she has extra room to chop and prepare food. You will find the building plans for this small, rustic kitchen island on the DIY blog, Shanty 2 Chic. The wood boards and butcher block for this project are available at most home improvement stores. The best part? You do not need a fully stocked wood shop to create. The critical tools required are a drill and a circular saw. When there is not an extra inch to spare for a small kitchen island, behold these clever tips seen in a tiny house by East Coast Tiny Homes. On the left, a pull out kitchen table performs double duty as a kitchen island. On the right two expanding cutting boards whip up additional room for cutting and chopping. Who needs walls loaded with cabinets when you have a kitchen island brimming with storage? Thibaut and Thewood, added deep shelving on three sides of this pitch-perfect example. Even not so small cooking spaces can benefit from having a compact kitchen island. In this example by Garrison Hullinger Interior Design based in Portland, Oregon, a narrow free-standing island topped off with Carrera marble creates more room to get meals ready.